Ghost-ring aperture is a fast, alternative, open sight that will save your hunt if your scope fails. Perfect for use on in-line muzzleloaders when hunting no-scope areas. Attaches in just seconds, without gunsmithing, to any Weaver-style base. Fully adjustable for windage and elevation. Includes front Test Post. Ghost ring aperture er en rask, alternativ, åpne syn som vil spare jakten Hvis omfanget mislykkes. Perfekt for bruk på innebygde muzzleloaders når jakt no gjennomgåtte områder. Festes på bare sekunder, uten Børsemakerutstyr, til Weaver stil base. Fullt justerbar for windage og høyde. Inkluderer foran Test innlegg. 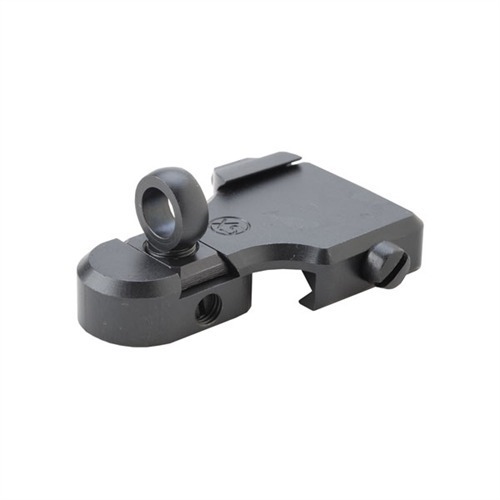 The low Weaver backup model will not readily work on a Savage 111 accutrigger model, the sight is thicker than the Weaver base for a Savage, so the overhang of the sight contacts the rifle's receiver. Not sure why Weaver bases are thinner for a Savage. Looking at Picatinny rail or shims, also possible Warne bases are thicker than Weaver. I have a XS set on a Marlin 45-70 and they are excellent. I was looking for a ghost ring or peep sight to mount on an aluminum picatinny rail that I previously affixed to the 11mm dovetail on a Weihrauch HW77 .22 underlever spring piston airgun. I saw this one and figured that I would give it a try. After receiving the WB-2000N-L Low Weaver Backup Ghost Ring I attempted to install it. The sight is steel and well made. The rear of this sight has to hang down off of the back of the rail and in the case of my picatinny rail I had to trim the rear of my rail by approximately 1/16" so that the rear of this sight could hang down there. My rail was not milspec so you may have different results. It appears that if you have very close to 0.5" from the rear of your rail to the center of the first slot you should not have to modify your rail for this to fit. The sight had to be made with the rear hanging off the back of your rail so that the ghost ring itself would be low enough to match your front sight but still be easily and widely adjustable for windage and elevation. I like the adjustment methods and it includes an extra ghost ring of slightly smaller dimensions. Produsentnr. : WB2000NL 647533006804 Ghost ring aperture er en rask, alternativ, åpne syn som vil spare jakten Hvis omfanget mislykkes. Perfekt for bruk på innebygde muzzleloaders når jakt no gjennomgåtte områder. Festes på bare sekunder, uten Børsemakerutstyr, til Weaver stil base. Fullt justerbar for windage og høyde. Inkluderer foran Test innlegg.